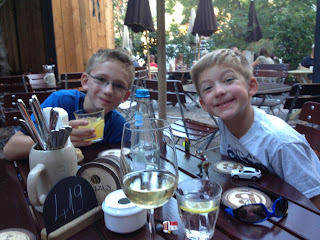 Recently I was asked how do the little C&Gs stay so well behaved in restaurants. I have to give some credit to the French. And the Germans. And the Danes. 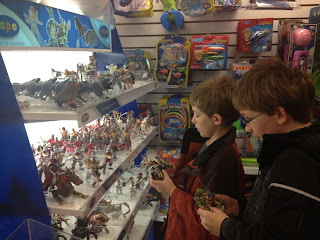 Somewhere along the way the little C&Gs became obsessed with the plastic medieval action figures by Papo and Schleich. They can be found almost anywhere and usually aren't more than $8 a piece. 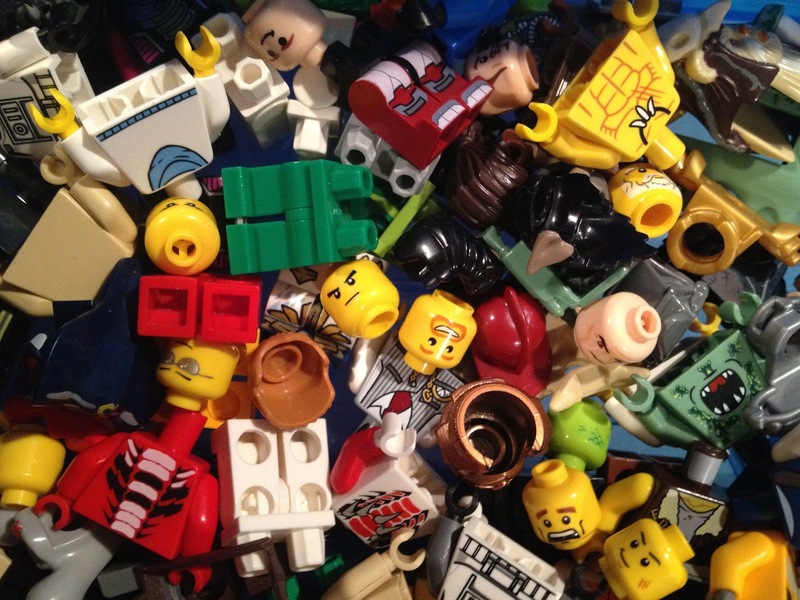 We've collected quite a few over the years and they've been sourced from as close as our local toy store and as far away as the Swedish Royal Armory gift shop in Stockholm. They're easily carried in a pocket (or in your purse if you're feeling generous) and virtually unbreakable. 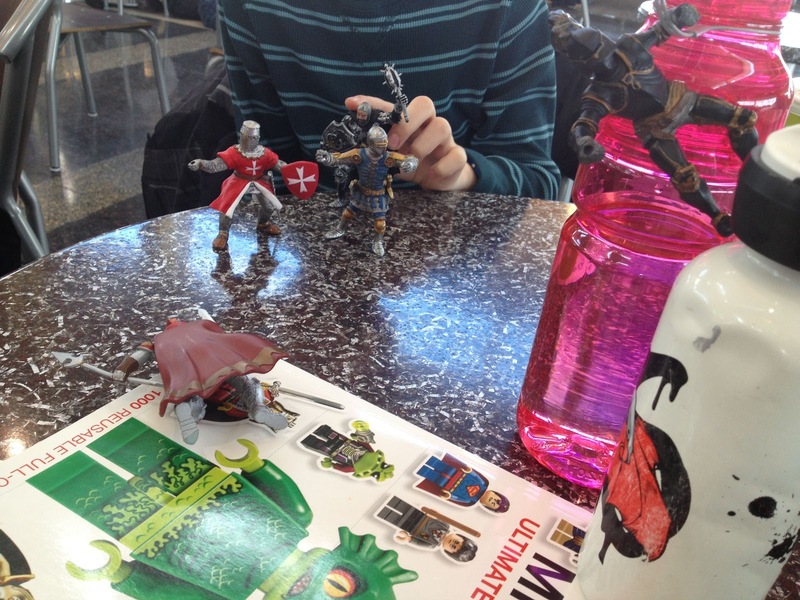 Killing time (with sword and shield) in the airport. Collections from both Papo and Schleich include animals, dinosaurs, dragons, elves, knights, and just about anything your boys could want. I'm sure there are some girlier ones too, but as you can imagine I've never noticed that part of the display. The boys will usually bring one or two with us to dinner, unless it's an extra special super fancy collared shirt affair. Then they know there won't be any toys on the table, but I'm sure they could make up a game with just a cloth napkin and the contents of the bread basket. Whatever they bring with them (or con me into storing in my purse) must be small and they are responsible for remembering to bring it back home. Legos, knights, and cars. Recipe for a buona notte. The little C&Gs use the knights to fight ongoing battles, wage war across the table with swords and shields, and generally create their own long running version of Braveheart. We aren't really sure what their "movies" are about, but we do hear a lot of "cut" and "action" while we're ordering cocktails. Along with "pow" and "I cut off your arm". Another thing to keep them busy at the table are crayons and coloring books. If I were more prepared I'd keep a supply in my tote bag, but I never seem to remember. Plus who wants to be carrying extra stuff around all day? Restaurants often have kids menus to color, and even hotel bars can provide coloring supplies if you ask nicely. One of our favorite fancy hotel bars, The Bristol Lounge at the Four Seasons in Boston, has a wonderful Boston activity book to keep them occupied while you relax on the comfy leather couches with drinks and snacks. And when they've run out of "movies" with the knights, colored all there is to color, and finished off the charcuterie platter, there's always a handful of Lego mini figures that can come out to play.